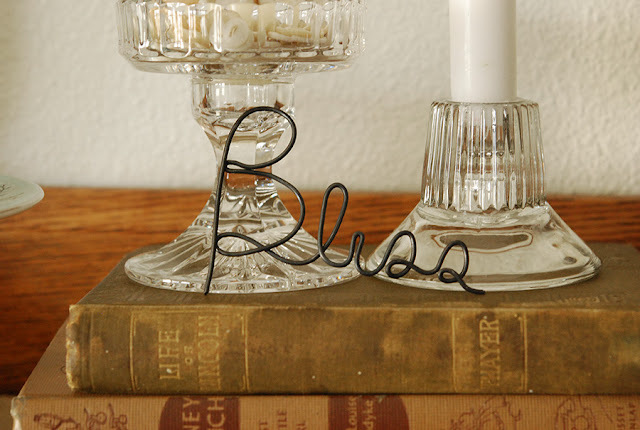 Bending Wire is "Bliss" to Me - Jill Ruth & Co. 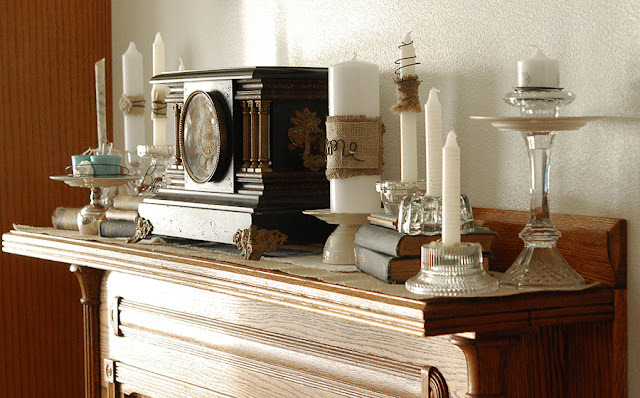 Here's our mantle updated with some of my thrift store finds from this post. The sun was coming and going so I took pictures quickly! And burlap, fabric, and wire are a great compliment to the glass! I added a burlap runner first on the mantle then a smaller muslin one. I did use a low temp. glue gun to attach some of the fabric pieces. So, it does mean that you can't burn the candles. I used to think I wouldn't have something in my house that I couldn't use. Oh, well! Once again, I change and adapt! I love wire. I've said it before, I'm sure I'll say it again. I have quite a few projects I'm working on using my hand formed wire pieces. 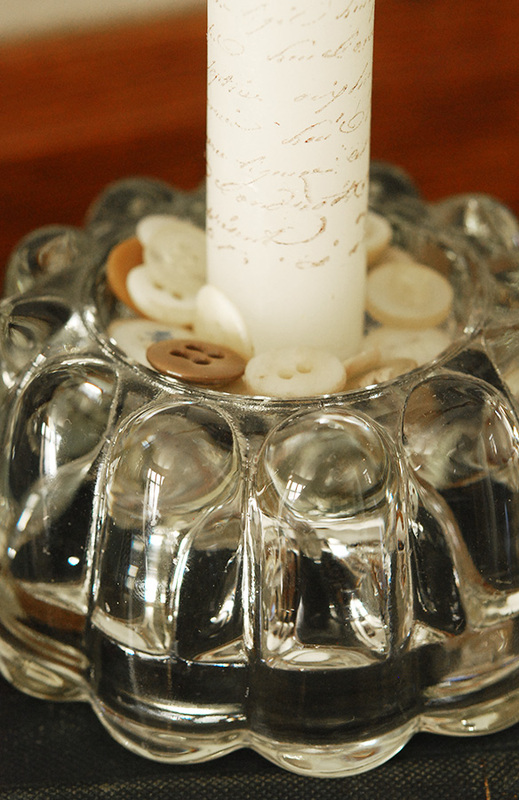 I added vintage buttons to most of the candle holder bases. I do think rusty screws and washers would look pretty cool too! I stamped some of the candles. This adds a really nice touch I think! Here is a small burlap flower, button, and more wire. I thought it would be fun to change out a candle with a sheet of vintage music with some scrap thread to keep it in tight. Sorry about the blur, the sun was under and out. Evidently, it was under here! 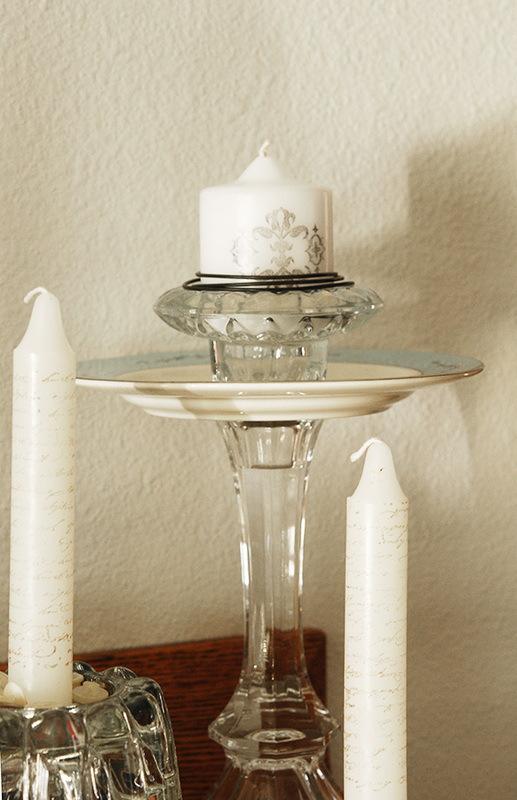 I paired plates with candle sticks and with silver pieces for the tiered look. Just a bit of strong adhesive and you're good to go! This silver cup belonged to "Tom S." according to the engraving on the side. I think a more tarnished piece would be great but someone at the thrift store had polished these up! 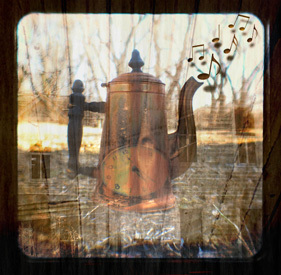 I didn't take the time to "re- tarnish" I have time on my side for that one! Just another stamp and wire accent. 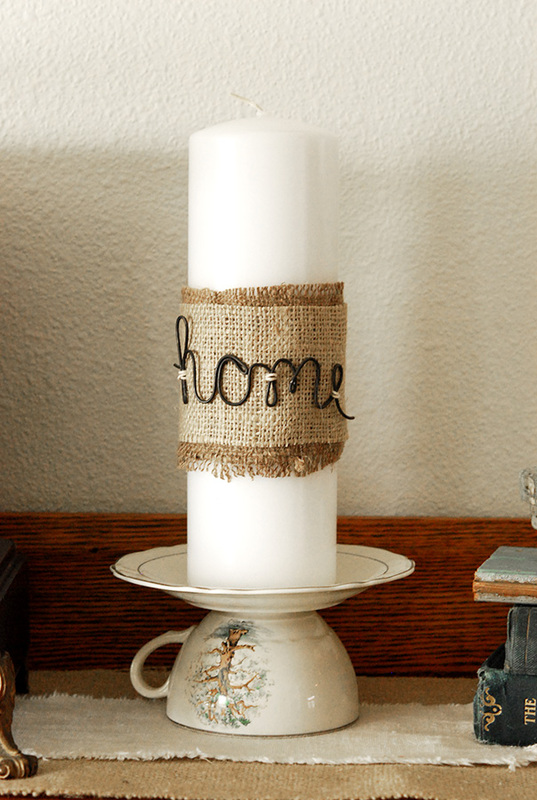 This time I sewed on my wire word to the burlap first then secured it to the candle with a low melt glue gun. The base is a teacup inverted and saucer secured with adhesive. I can't decide if the tree looks like fall because of the brown or spring because of the emerging green leaves. The saucer has the same pretty tree. I'm linking this post up to Kathleen at Faded Charm's White Wednesday and to Linda at Coastal Charm for Nifty Thrifty Tuesday. 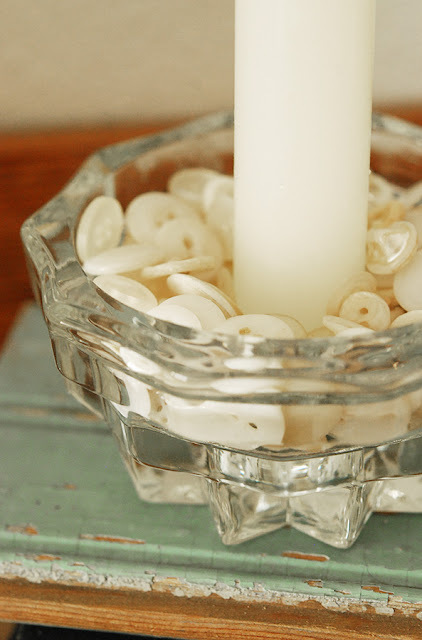 Question: Would you have candles in your home that you can't burn because of an embellishment? And, if so, would you burn the wick just a bit so it doesn't look new and untouchable? Oh my, I am in love with everything in this post. 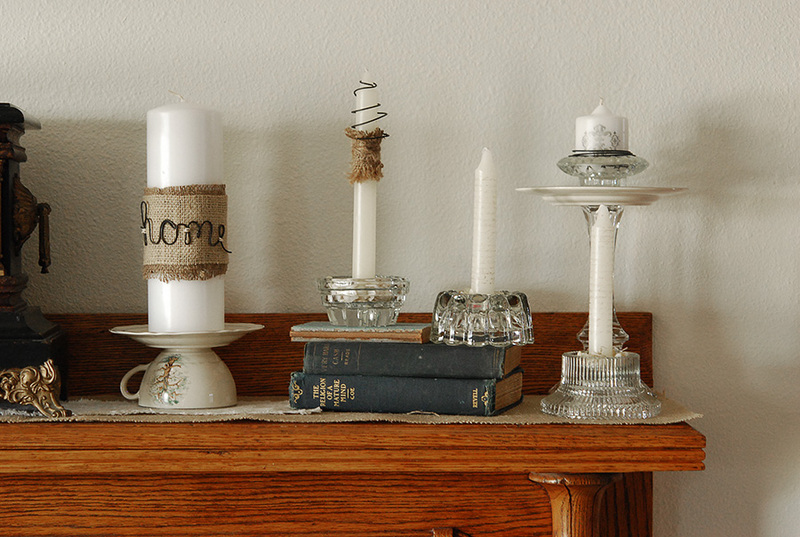 The buttons in the candleholder, the wire words, the burlap....everything! 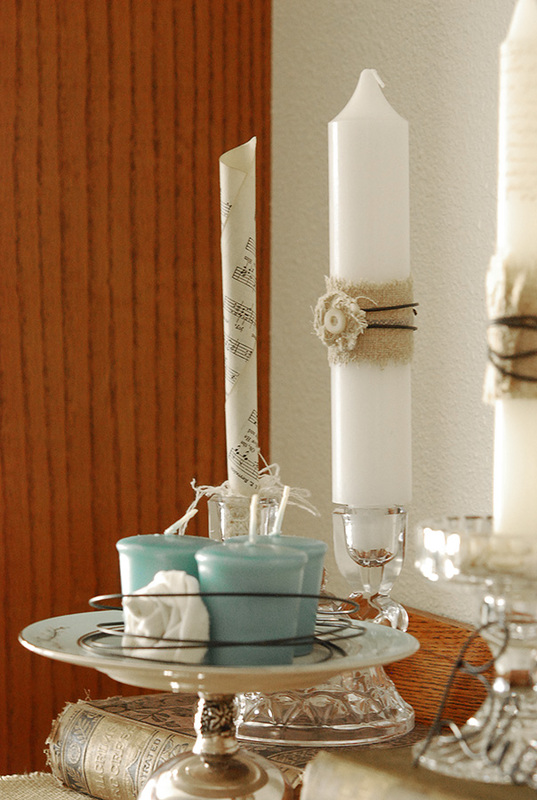 The details on the candles are just stunning, and I love the contrasts of materials. Love love love it all! I found you through NTT. I'm following you and can't wait to check back!! Wonderful wire. All your touches make the mantel YOU! Love all the texture and shapes. 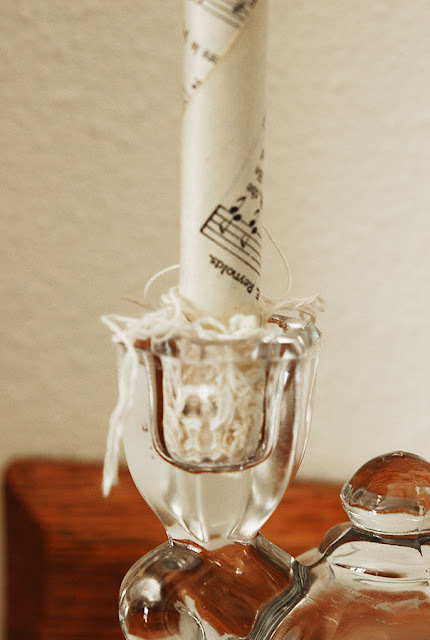 I think I'd burn the wick just to make the candle look used. OH NO! I went through a phase of bending wire into face shapes and dog shapes a few years back, and now here you go inspiring me ( AGAIN) to pick up the coils and pliers once more. Is there no end to you inspiring me? I do need to sleep ya know ! I do love all of this. I like a burned wick. However, for safety reasons...it might be best to leave it new and unburned so that some unknowing person might be less likely to light it. 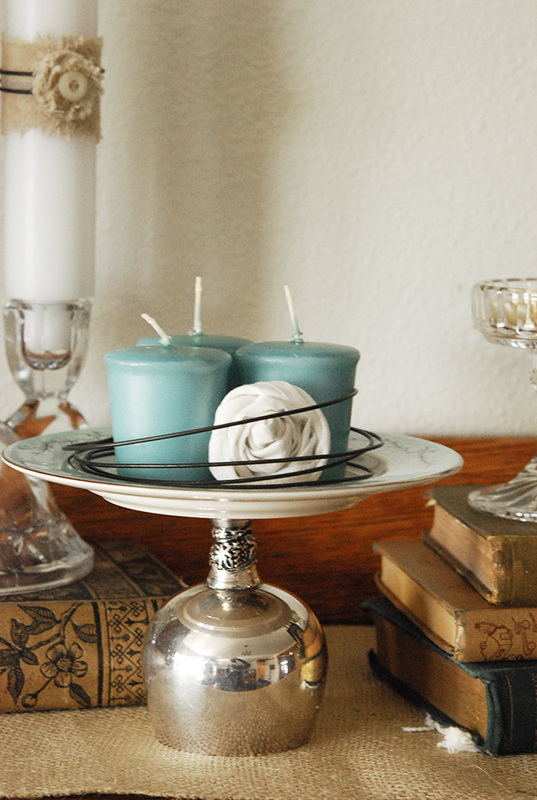 More great ideas from the inspiration girl herself! Now I know what to do with some leftover buttons! Burn those candle wicks a bit. You know we don't want anything too perfect in our homes! Congrats on the shout out in the Flea Market mag! Now I can say I know somebody famous! I love what you did here. Lots and lots of really really great ideas! I love all the wire! I'm especially drawn to the words. And stamping candles? Oh, that's something I've got to try! Love it all! 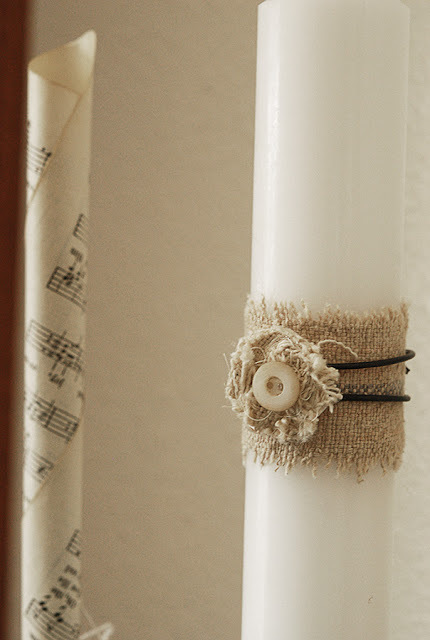 One of my best finds is a roll of old black wire that is a little rusty, I use it on everything... I love it! 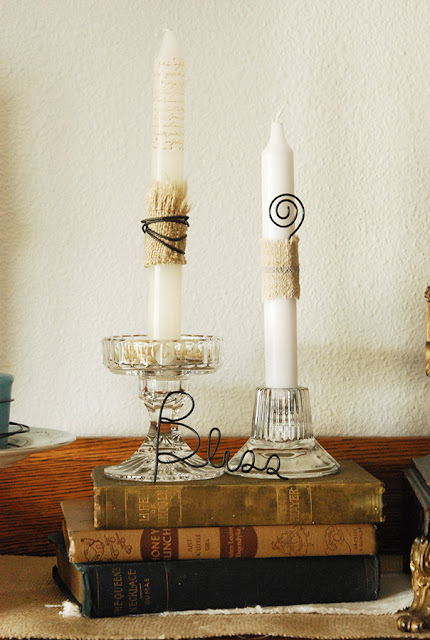 Love the wire and burlap on the candles. Yes! I do have candles that I dont burn because of the embellishment and because my mom lives with us and is scared of fire so we only burn candles encased in glass. Love your ideas! Don't you hate when the thrift store polishes the tarnish off?! I think the older ladies that volunteer at mine think the tarnish makes the items unsellable and I think just the opposite! Thanks for sharing your beautiful ideas with all of my favorite types of items! Hugs and Tweets!